In a new study out Thursday from the Centers for Disease Control, the vaccine proved effective just over half of the time. And among seniors who are 65 years old and older, one of the most vulnerable populations, the vaccine only offered nine percent protection. NBC’s Robert Bazell reports. >>> it has so far been an awful flu season , and it's not over. and this year, as we seem to do every year, we've been passing on to you the advice of the experts. whatever you do, make sure you get that flu shot . well, the new numbers out tonight from the cdc show the flu vaccine has actually been a dismal failure among those who need its protection the most. as many as 49,000 americans die from the flu every year, and while we don't have the total numbers for this flu season yet, they will be high. and the number of people 65 and over, hospitalized for the flu, has been the highest since they started tabulating in 2005 . our report tonight from our chief science correspondent, robert bazell . >> reporter: it has been the constant message from the cdc throughout this bad flu season . >> protect yourself. protect your family. everyone needs a flu vaccine . >> reporter: but cdc's own study out today shows that surprisingly often, the vaccine just doesn't work. even though it matched this year's flu strain. overall, the vaccine proved effective, just over half. 56% of the time. but against the dangerous a-strain in people 65 and over, the vaccine offered only 9% protection. in the very age group most likely to be hospitalized, and even die. >> we simply need a better vaccine against influenza. one that works better and lasts longer. >> reporter: infectious disease expert michael oesterhom got through this year. 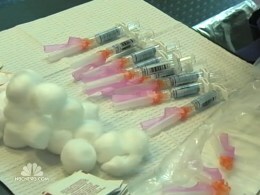 >> over the past decade, the public health community has said the flu vaccine would be answer. now as we have improved in the science of our studies of influenza vaccine , we know that's not the case. >> reporter: oesterhom and many public health officials agree more research is needed to find a better vaccine. meanwhile, they urge people to continue to get vaccinated. >> although it's far from perfect, flu vaccination is by far the best tool we have to protect from flu.